The viewer is at eye level, low down or standing in the water at the centre of the composition, possibly on a boat, a low platform, or even fishing? The still, calm river flows across the whole of the foreground to the edge of the canvas. We are looking directly towards the distant horizon where the river disappears at the focal point, which is at the top of the chimney on the house roof, partially hidden by the surrounding trees. We are guided into and through the scene by the enclosed banking, masking buildings hidden by trees and shrubbery on the right of the picture. On the banking on the left side frame there are trees in the middle ground, which reminds us this is land locked water and not the open sea. The sky is clear and bright but not sunny, reflecting and duplicating the same pale colour in the water. The muted tones of greens and blues against the hints of pinkish-brown warmth in the brick buildings emphasises the lack of sunlight. It could be early morning or late evening in this empty stillness. The delicate use of brush marks creates clumps of grasses dancing rhythmically across the canvas, growing out of the shallow water and along the edges of the banking, emphasising space and the natural wildness of the location, nature takes over. The land meanders in and out forming small harbours for the water to overflow onto the land in this very English country scene. Space and perspective are created by the open water of the foreground and large clumps of grasses slightly blocking our path as they grow up and out of the water, subtly guiding our eyes to the middle ground trees and on to the distant horizon. The roaming embankment winding in and out of the middle ground to the sides of the composition, together with the spiky feathery marks of the grasses, take our eyes in and out, across, through, and into the scene before us. We are the only people in this still, calm, spacious scene, undisturbed by sight or sound of any busy world that may be asleep, nestled and hidden by the protective trees. 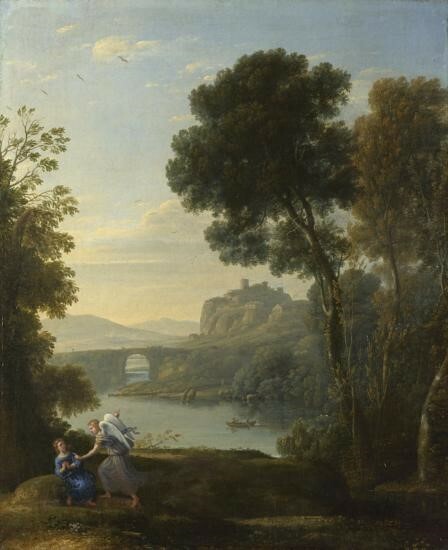 We see those same influences in T M Richardson Jnr's painting, A Continental Lake View. 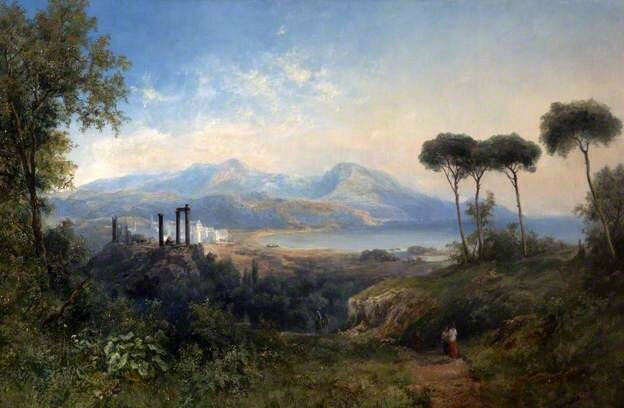 T M Richardson Jnr, A Continental Lake View (8) 1857, watercolour, 14" x 27"
size 345 x 845 mm, National Gallery of Scotland, Edinburgh. 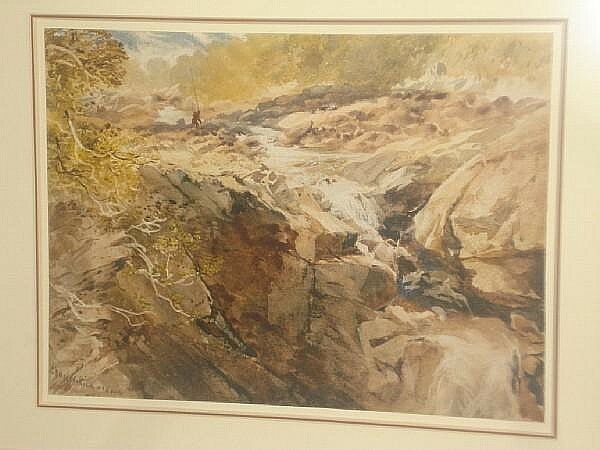 However, drawing the attention of John Ruskin for whatever reason would in itself be a compliment to the artist. Indeed, that Ruskin saw fit to comment would be enough within artistic circles. 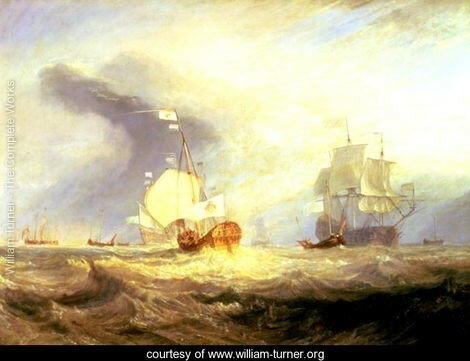 We can also see the influence of another great seascape artist on Charles Richardson’s work, that of J W M Turner. 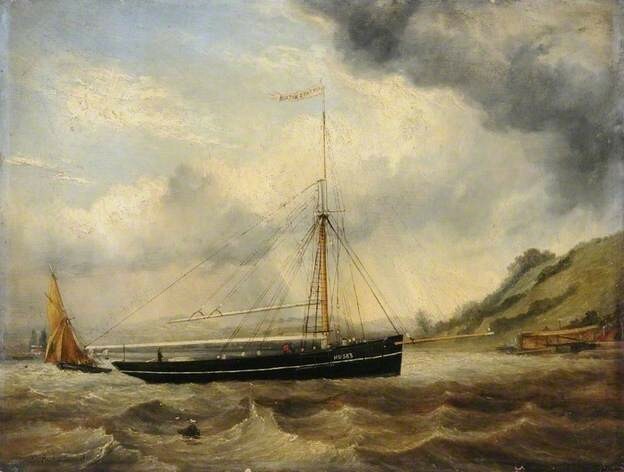 Turner’s fascination for the power of the sea and nature’s elements can be seen at work within Turner’s composition of Admiral Von Trumps Barge. In Charles Richardson’s seascape, Untitled, we see him capture the power of the sea set against a stormy sky. 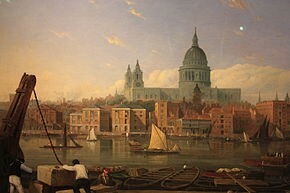 Although a great deal is not known of Charles Richardson’s life, he was evidently a success alongside his five brothers, which in itself is unusual - so many talented artists in one family. He enjoyed a career as an artist in his own lifetime, which enabled him to focus on his painting and travel. Most of his work is in private collections.